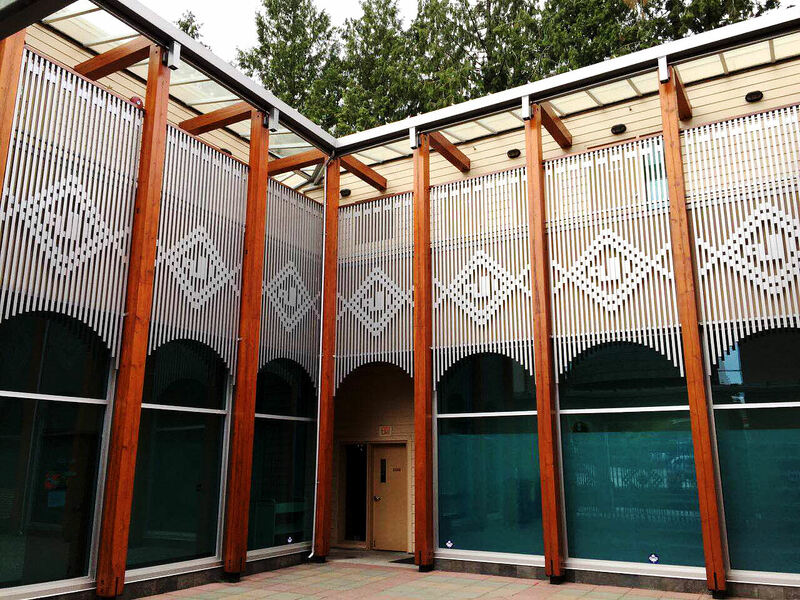 On our recent trip to Vancouver, we had just finished exploring Buntzen Lake and eating Malaysian & Singaporean food at Makan Place Restaurant (in Burnaby), but on our drive back to downtown Vancouver, we just happened to drive past this beautiful building by accident, just down the street from the restaurant, Masjid Al Salam & Education Centre. We spotted the minaret from down the street and said to each other "Is that a masjid? ", and coming closer we were stunned by its beauty! We were so curious about the masjid that after missing the turn, we spent around 10 minutes making u-turns to find our way back to it to have a tour and drop a few rakat, lol. I'm glad we did. First thing that floored us (ba-dum, tsh!) was their parking lot. WOAH. 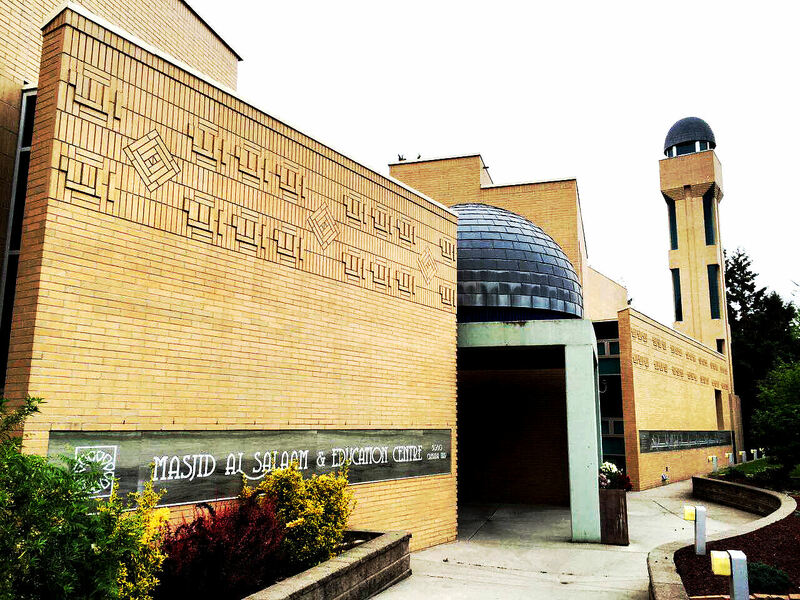 If you've been to masajid in Toronto, you know what a problem parking (or the lack of it) is. 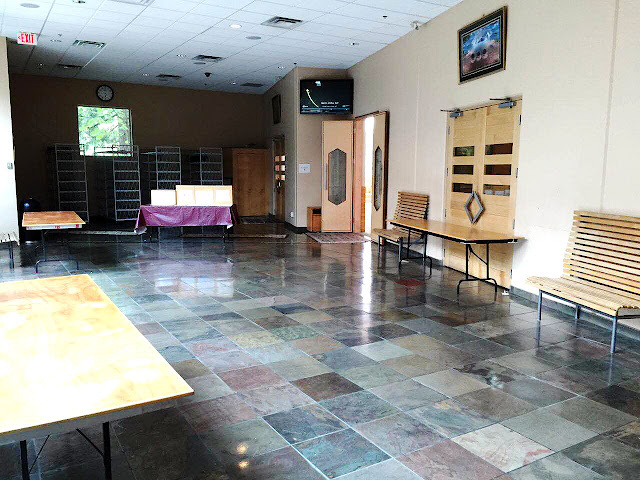 This masjid has a massive, well maintained underground parking lot, complete with..
You guessed it! 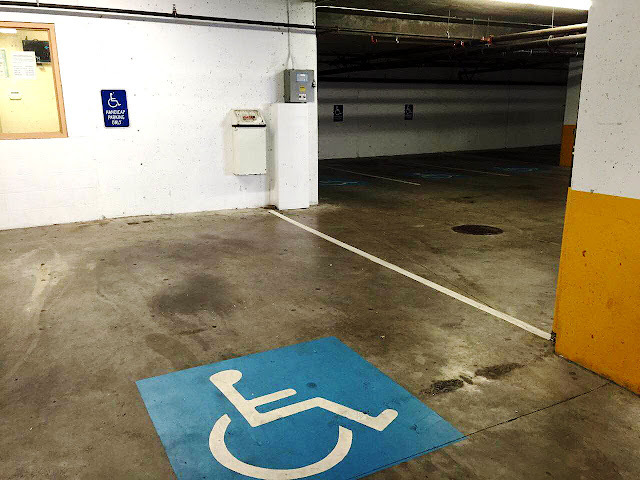 Accessibility parking! I know this is a pretty sad thing to be excited about when this should be a given everywhere, but when you're from Toronto finding an awesomely accessible parking lot at a masjid is usually a big deal. Next thing to be excited about, an elevator! Yes! 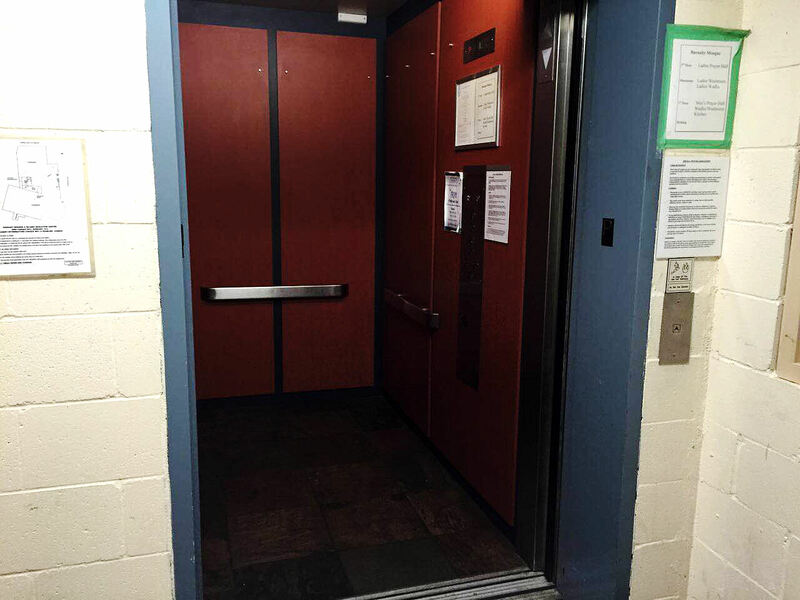 The elevator went from the parking level to the top floor where the sisters area was, so that's where I (Maryam) went. My eyes were presented an absolutely gorgeous view at the top floor. First thing you'll see as you exit the elevator to your left is an outdoor balcony that leads to what I can only guess is classrooms. The architecture is stunning, and the entire masjid was spotless. The shoes area and doors to the sisters' prayer area was lovely, and they had a screen linking to their Imam's facebook page, which I will link to here. The sisters prayer area was marvellous. Everything was so new, spacious, and clean. I explored a little further in the sisters area and found .. hey what's this? Yes! A mothers room for moms who need it! At the time the masjid was empty, but I expect now, during Ramadan, that this room's probably quite lively. I (quick reminder that this is a woman is writing ^_^) would normally not photograph a bathroom, but I was so impressed by the layout that I wanted to show you guys. The bathroom is also very spacious and absolutely spotless, complete with a ghusul (shower) area as well. There's a large changing table area. And you'll find your usual wudu (ablution) area as well. I took the elevator downstairs to the main hall to tell my husband about my discoveries and found him similarly spellbound by the masjid's beauty. This is the common area for brothers. 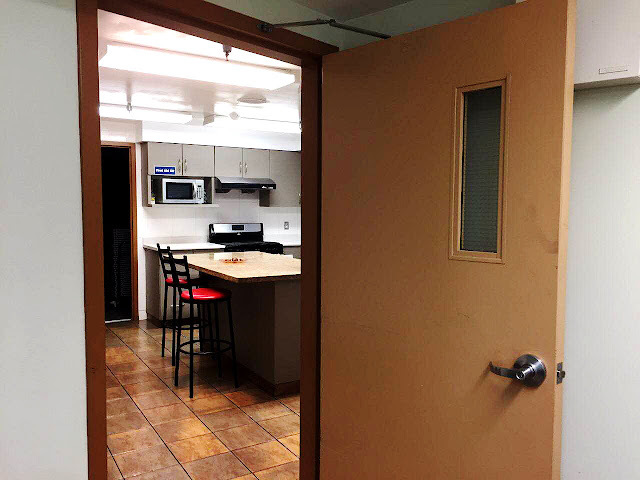 There's a door in this area that accesses an outside courtyard, which is the bottom of the classrooms from the sister's level. This is the brothers prayer area. The mihrab where the imam leads the prayer at the front is a beautiful stained glass window looking out into a beautiful nature scene. There's also access to a kitchen from this area, I think that they cook for catering at the masjid, I had saw some signs advertising menus. I was even impressed with the detailing of the floors! The "No shoes past the line" was actually engraved into the tiles. So pretty! Best of all, there's a huge community hall. It was here that my husband and I came upon an elder brother who was diligently cleaning and polishing all the surfaces of the brothers' entrance hall. He told us that the masjid was designed by a muslim architect and was completed only a few years ago. They used to have several imams for the masjid on a rotation basis but recently have hired a permanant imam alhamdulilah. The masjid was pretty empty when we visited, and he explained that the area isn't very accessible by walking so most people drive, but jumah salah is usually jam packed. He said that the donations for the masjid was raised mostly by Fijian muslims many years ago, and the costs for the masjid has been paid off, however they still rely on donations for month-by-month operations. Please consider donating to the masjid by clicking here. It was such a pleasure visiting this beautiful masjid, and I imagine that it's a beautiful place to go during Ramadan, as well. May Allah grant abundant blessings to their community and bless them with wealth to maintain the masjid indefinitely, ameen. Be sure to Like and Share this article on Facebook!